Last week, my friend Guy celebrated his birthday, and in typical, punny form, we threw him a potluck with the theme of “Guy foods.” Get it? (If you don’t, you’re an idiot). Anyway, I didn’t know what to make, but I knew it probably should revolve around some sort of giant slab of meat. Ribs? Nah — I’d have to make too many for all the hungry mouths. Wings? Same problem. Then I remembered some dish that Tyler Florence once made on Tyler’s Ultimate. 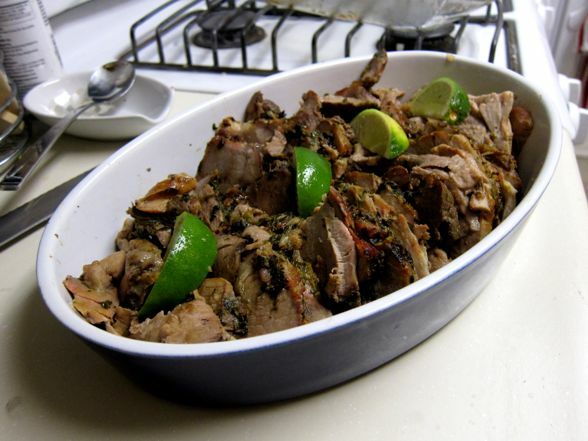 After some internet rummaging, I found the recipe: a Pork Shoulder “Pernil” with Cilantro-Citrus Adobo. I instantly recalled having watched him make it on Food Network, my mouth watering the whole time. Now would be a perfect time to attempt it. And it couldn’t be simpler: just make a rub, put it on the meat, and let ‘er rip!